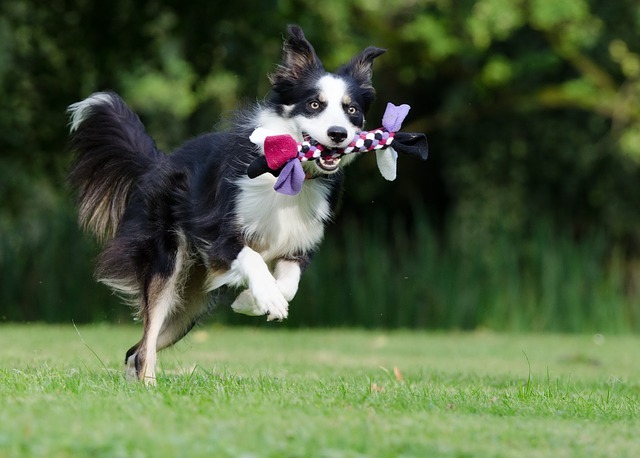 When it comes to border collies, continual play and mental stimulation are important. Plenty of this and your collie will live the good life. Because these dogs are so intelligent and have so much energy, not all toys are good for them. You need to know which toys are the best dog toys for border collies so you don’t waste your money on toys they don’t want. Dog toys come in all shapes and sizes. With thousands of dog toys available on the market, choosing the right ones can be confusing. Over the years I have figured this out for you. I have tested with my own border collie, fished through the sea of information online, and picked what I think are the best toys for border collies. And in this article I share them. But first, let’s talk about the types of toys out there, and which ones are better for your collie. 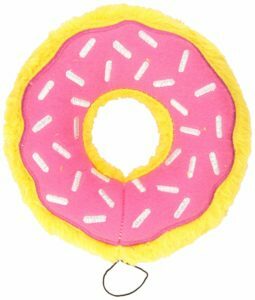 There are so many different kinds of dog toys out there, it can be hard to choose the best ones. 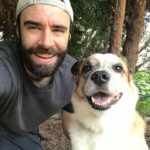 For a dog that is so intelligent, so energetic, and so driven, there are certain toys that definitely do work and certain toys that definitely don’t work. Interactive dog toys are some of the best dog toys for border collies. They combine the act of playing with mental stimulation so your doggie gets tired both physically and mentally. Since interactive toys cover a wide range of toys, I will talk about each one below. Puzzle toys are interactive dog toys in which the dog has to solve some sort of puzzle to get the treats at the end. These toys look like puzzles made for kids but they are in fact made for dogs. Puzzle toys consist of flaps, levers, or buttons the dog has to use to get to the compartments where the treats are. While puzzle toys may not exhaust your border collie as much physically, they will definitely exhaust them mentally. There are a few brands that make puzzle toys for dogs and they are usually made based on the level of difficulty. That is, the harder the puzzle is to solve, the higher the level it is. Each level has a few different games for you to choose from. If you were to buy a puzzle game for your border collie, you could skip the first level and go straight to the medium and hard levels. Treat toys are like puzzle toys in that the dog is working for the treats, but different in that they are much easier. 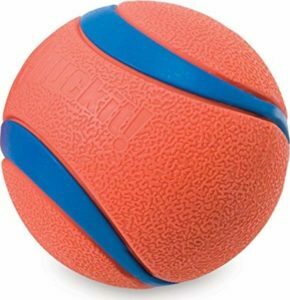 Treat toys are usually made of rubber or plastic and they generally look like balls or tug toys. But they are different in that you fill them with treats and the dog has to figure out a way to get them out. These toys are fun for border collies because dispense treats and act as a throwing toy as well. You may have seen them before. The little squirrels poking their menacing heads out of the holes in the log. I don’t know what it is, but for some reason, dogs love these hide and seek toys. Hide-and-seek toys are everywhere now. They even come in all different themes. banana, your collie will love these. Snuffle mats are a toy that you may not have heard of. I know I hadn’t heard of them until recently. They are fuzzy looking mats made to teach your dog how to forage. They are also great for keeping them entertained when they are bored. Snuffle mats work as if there were food hidden in tall grass. You put the food or treats between the pieces of fabric and the dog has to sniff them out. Snuffle mats can act as a way to feed your dog, or to keep them entertained for a little while. I haven’t tried one of these yet, but from what I have heard from other border collie owners, they love it. If my border collie could play tug of war with me for hours on end and do nothing else, he would. Unfortunately, I don’t have the time, nor stamina to do this. Tug toys come in all shapes and sizes. Some are simple ropes, while some are rubber toys in the shape of an eight. No matter the case, tug toys work with you at one end, and your dog pulling you away at the other end. Toys made for fetching are usually balls of different sizes and colors, but they can also be frisbees, rubber sticks, and even stuffed animals. Anything that you can throw, and a dog can fit in his mouth is suitable for playing fetch. One of my dog’s favorite toys is his Zinger toy. I’m pretty sure the brand isn’t around anymore, but the concept is the same across other brands. The toy consists of an animal with a loop at the front, and an elastic cord in the back. It acts as a slingshot of sorts, and you can send it flying a long ways away with very little effort. Last but not least are chew toys. I saved this one for last because I wouldn’t consider them toys. Also, I choose not to give my border collie chew toys for a few reasons which I will share in a second. Chew toys are objects made for dogs that love to chew on things. They can be bones, antlers, nylon bones, bully sticks, rings, and more. It seems like with chew toys, the more natural you get, the more expensive the price. For example, you can get a nylon bone for a few dollars, but for an antler, you are talking $20+. The reason I never liked chew toys for my border collie is that he loves to chew, and chew, and chew. He will chew until his gums are bleeding, and then he will keep chewing. He will chew so much that he will eat the chew toy that is not supposed to be eaten. There are plenty of chew toys out there that are safe to eat. But when he goes through an edible bone in a couple hours, that is a hefty amount of money spent on chew toys. Of course, there are plenty of other toys out there. Going through my border collie’s toy box, I can count quite a few. Most of these toys could be categorized as stuffed animals, plush toys, or squeaker toys. Some are soft and fluffy, while some are tough and durable. 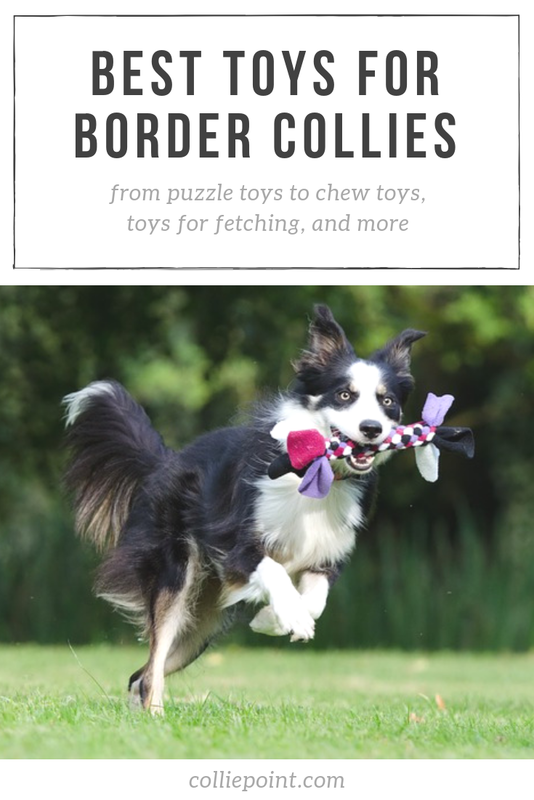 Now that you know a little more about dog toys, here are my picks for the best dog toys for border collies. Let’s start with this ZippyPaws hide-and-seek squirrel toy. This toy is exactly what it looks like. It’s a plush tree trunk plush toy with three holes that dogs dig their noses in to get the squirrels out. You wouldn’t think a border collie would love this toy, but they sure as heck do and mine plays with it over and over again. 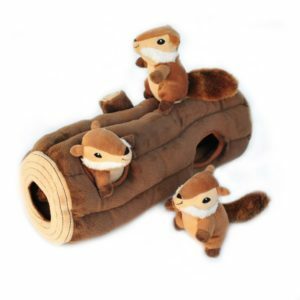 Each squirrel has a squeaker inside and can even act as toys on their own. They are actually funny to play fetch with and makes it almost like a 2-in-1 toy. This toy is a plush toy is it is definitely not indestructible. However, dogs get so distracted by what’s inside, it seems to hold up pretty well. This toy is easier to figure out then some of the other puzzle toys, but it’s great for keeping your dog entertained until you have to put the squirrels back in. The Trixie Pet Products brand is known for their puzzle games for dogs. Their interactive puzzle toys start with level one and go all the way up to level three. Each puzzle acts as a way to mentally stimulate your dog, and the higher the level, the harder they get. There is currently one toy for level 1, two toys for level 2 and three toys for level 3. 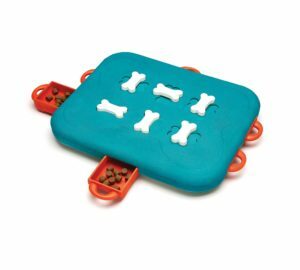 These puzzles consist of a series of flaps to open, ropes to pull, knobs to push, and other methods of accessing the treats at the end. The photo above shows the level 3 Chess Game. This game has pieces that you can slide to hide treats and other pieces that you can cover the treats with. If you want to watch more, you can see the videos for each of the product and how on the Amazon listing for each. Like the Trixie puzzle toys, Nina Ottosson also makes a series of puzzle toys for dogs that come in different levels based on difficulty. These toys function in the same way but appear to be harder puzzles than the Trixie ones. The puzzle shown above is a level 3 puzzle. It requires dogs to turn the bones into the correct position to unlock the drawers that contain the treats. The Nina Ottosson toys don’t receive as good of ratings overall because most dog owners complain that their dogs aren’t smart enough to figure them out. Lucky for you, a harder level of difficulty should be no problem for a border collie! The Outward Hound Tail Teaser toy is like a giant cat wand toy, but for dogs. It’s a toy you can swing back and forth, around in circles, and up in the air. Border collies love this toy because they are always ready to chase something. Not only can your dog chase this toy, they can also play tug with it as well. It’s the perfect toy to exercise their natural prey drive. This is a great toy to use for wearing out your dog if you don’t feel like taking them on a long walk. You move around in a small area and watch your dog chase this toy all over the place. You can even use it inside when the weather is bad outside. Like it says in the name, this Kong toy is a classic dog toy. This dog toy is nothing more than what you see in the picture. It’s a rubber toy that kinda looks like a snowman without arms with a large hole running through the middle. This hole is where you can fill it with the Kong Easy Treat, or other large treats. The Kong Easy Treat comes in a bottle that almost looks like cheese whiz, and you fill the toy with it (Keep in mind that you have to buy it separately). If treats aren’t your thing, don’t worry. Your border collie will have just as much fun playing fetch with this toy. Make sure to throw it high in the air, because when it hits the ground, the funny shape causes it to bounce all over the place. This Kong toy is great. I have had these with all my dogs for years. These are indestructible dog toys if I’ve ever seen one. The only time you feel like you might need another one is when your dog somehow loses the one they already have! While this may look like the Kong Classic Dog Toy featured above, this toy is a little bit different. 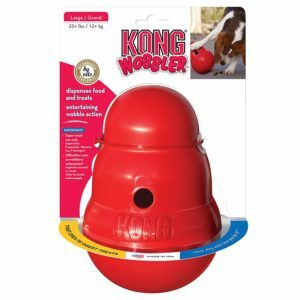 Instead of filling the toy with the cheese whiz Kong treats, you fill it with your own dog food or small dog treats. 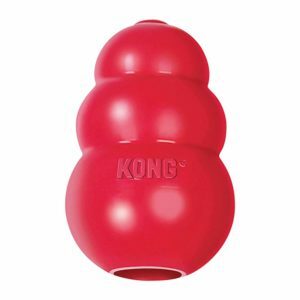 This kong toy unscrews from the bottom so you can scoop the treats in. There is a hole on the side that is big enough to let a treat out once in a while, but small enough so that your dog has to work for it. And work for it they will. If your collie is food motivated like mine, you will see them hitting this toy around until every last treat is out of it. Like the kong classic toy, this one also comes in different sizes (Small and large) depending on how big your pup is. You can even wash it in the dishwasher once it gets nice and slobbery on the inside. These next two toys go hand in hand. The first one is the Chuckit! Ultra Ball. Now you may be thinking to yourself, why would I want to buy a ball like this when I could go out in the garage and get an old tennis ball? Well, I thought the same thing until I got one of these. Yes, they look and act like a ball, but they are a little more than that. These balls are very durable and well made for the money. The bright color is easy to spot from anywhere, especially for your dog. They are very bouncy, so your border collie will be running after it for a while. These balls are waterproof and they even float in the water. If you’re looking to get one of these Chuckit! 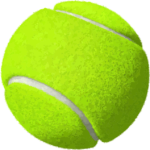 balls, keep in mind that the medium size one is the size of a tennis ball, and you can go from there. Now for the second toy, the Chuckit! Dog Ball Launcher. This toy is not as much a toy but more of a tool to help you throw a ball further with less strength. The Chuckit! Dog Ball Launcher acts as like a flexible, extended arm. You place the ball in the cup at the end and hold on to the grip at the other end. Throw the ball in a similar motion to how you would throw a ball, but watch it go way further and way faster. It requires less strength to throw a ball twice as far. The best part is, you don’t ever have to touch the ball. You can put the cup around the ball on the ground and “lock” the ball into place so you can pick it up and throw it again. If you’re ready to get both, this launcher goes hand in hand with the medium size Chuckit! Balls. Let me preface this one by saying: This dog toy is not for chewers. Now you may be thinking, “Oh great now he’s really lost it…”, but you have to get one of these for your border collie! While it may not be the most durable toy, for a collie that knows not to destroy every toy they get, this toy is hilarious and fun. Not only does it look like they are eating a giant donut when they pick it up, they love the squeaker inside. This is actually one of my collie’s favorite toys to play fetch with. You can throw it like a frisbee, and he loves squeaking the toy when he’s running back with it in his mouth. Last but not least is a good old tennis ball. If all else fails, or you don’t feel like going out and spending $25 – $50 on a set of toys today, then you can always resort to a tennis ball. I have never seen a day in my life where a border collie or any other dog turned down the chance to chase after a tennis ball. The best part is they are dirt cheap, and you can usually find one laying around somewhere anyway. There you have it. That’s my list of the best toys for border collies. Hopefully, you are a little less confused now. Toys come in all shapes and sizes. Some are better for destructive dogs and some are better for gentle dogs. Some are better for self-entertainment, while some need you to get involved. Keep in mind that not all these toys work for every border collie. Not all border collies are the same, so you have to experiment and figure out what works best for you and your dog. That’s what it comes down to when picking toys for your border collie. Take the suggestions above, get a few, and try them out. If they don’t work, try a few other out. Play around until you find the best toys for your border collie. If you have ever tried any of these toys, or if you have other recommendations that I didn’t mention above, let me know in the comments below! I just brought home two 6 week old Border pups! You’re welcome, Krystal. How have they been so far? ?